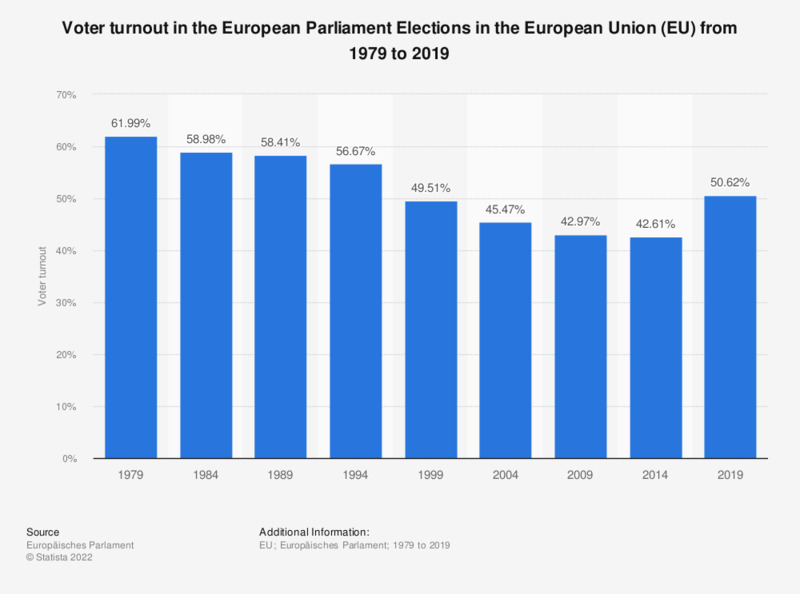 This statistic shows the voter turnout during the European Parliament Elections in the European Union (EU) from 1979 to 2014. In 1979, 62 percent of EU citizens voted. Since then, turnout had experienced a substantial decrease despite the minute rise of 0.9 percent in 2014. Further data is available regarding the European Parliament Elections, such as the number of seats won by political group. This statistic has information showing that the Group of the European People's Party (EPP) had gained 221 seats in the parliament. So too is there information concerning the distribution of seats won by country, the total number of seats were 751, 96 of these were occupied by German politicians. On a scale of 0 to 10 with 10 meaning definitely would vote and 0 meaning would not vote, how likely are you to vote at the next European election?